Anna Hillburg shows off many talents in her debut record. When I was in high school, I had this iTunes playlist that was simply titled "Fields." It was meant for the transition of seasons from spring to summer, a time when all I wanted to do was spend time outside and lie in the many fields in our kind of rural but still suburban New Jersey town. It was filled with songs by artists like Hem, The Watson Twins, Joanna Newsom, Smoosh, and Slow Club that made me feel all kinds of dreamy warm weather vibes. Even though I first made the playlist in 2009, I still revisit the mix every May to get me excited for the summer months before I realize how horribly hot it gets on the East Coast. The first time I heard Anna Hillburg via our friend Ian over at Cactus-Mouth, I knew she would have fit perfectly within this selection of artists and songs. Anna Hillburg has had a presence in music, specifically in San Francisco, for quite some time. According to her Bandcamp, before taking on the role of solo artist, she was half of the band Dreamdate and has lent her various skills to bands such as The Dodos and the Fresh & Onlys. It appears as if Anna can do it all – she can write, sing, and play a whole bunch of instruments (drums, bass, guitar, trumpet, and more). It seems like we've been listening to Anna without knowing it for quite some time. And after hearing her self-titled record, which was recently released on California Clap Records, I couldn't be happier that she decided to try her hand at solo artist. Although I find myself listening to more lo-fi and garagey music lately, Anna's ability to take on a new genre with every song reminds me how much love I have for female singer-songwriters. If Anna had made an album that had sounded like one of the songs on Anna Hillburg, it would have been a great album. But she doesn't settle for just a singular sound. Instead, she takes different styles from different times and expands on them in roughly three or four minutes. She begins with the bittersweet "Your Room", which is drenched in upbeat piano and harmonies despite the despondent nature of the song. The third track, "For Good" is a twirling ballad that displays the beauty in Anna's voice (and her trumpet skills). "Not Takin' Your Man" is a stomping country ballad that's tinged with just enough banjo that it comes off as appealing rather than annoying (in my notes I said it was "hella country but in a cool way"). "Everyone's Eyes" is the album's farthest reach into rock territory and kind of sounds like a King Tuff song if you toned down the wildness. It's kind of unbelievable how much ground Anna is able to cover in just thirteen songs. The one constant thread that's evident throughout the album is that it's clear that Anna draws inspiration from female singers of the past. Unfortunately I'm not very knowledgable about the classics (Patsy Cline, Loretta Lynn, Connie Francis, etc) so I'm going to go binge on this album and lady oldies for the next week. 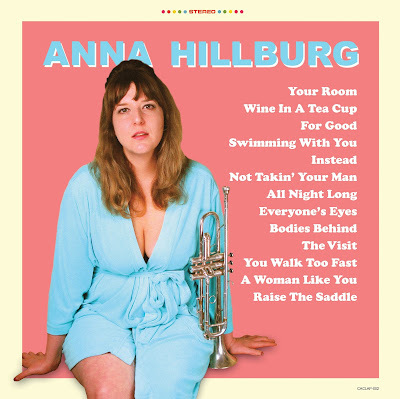 Anna Hillburg can be purchased from California Clap Records here.